"This famous 1947 set makes a welcome return to the catalogues. 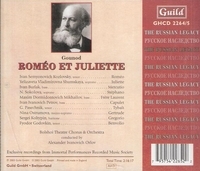 There was, remarkably, another Bolshoi recording of ROMEO ET JULIETTE in the same year with the title roles taken by Lemeshev and Maslennikova, rivals to the present pairing of Kozlovsky and Shumskaya but it's this one that has generated the greater esteem over the years. Guild has done their level best with the recording, which is pretty standard for this period in Russia. The recording level, as they indicate in a note by Richard Caniell, is variable and there is some blasting at various climactic points. Additionally the vocal perspective swirls around and it is sometimes the aural equivalent of being disorientated in a snowdrift. One should also note the acidic, resinous sound of the strings and the untamed and characteristically raucous brass. Unsubtle is the 'mot juste' and one should prepare oneself in advance for these obvious deficiencies, accept them and then, having absorbed them (and in this performance they can be absorbed), admire the wealth of vocal talent on display here. Kozlovsky is the star, even then still Russia's most famous tenor. We can hear as early as his recitative 'Eh bien! Que l'avertissement' in Act I that, for all his lyrical ease and command, his voice has a characteristic rather 'white' tone - not bleached but equally not obviously captivatingly beautiful as, say, Bjorling's was. His vibrato is precisely employed and to great dramatic effect - sample 'O nuit!' From Act II. His control of dynamics, even given the relatively primitive recording, is sovereign. He employs a floated head voice but it's not fully in the French voix mixte tradition (head voice mixed with falsetto) though it does convey great emotive power when he chooses to employ it. His technique is secure and strong, allowing him moments of ringing declamation as in Act III's 'Allons! Tu ne me connais pasé' and also the dramatic and histrionic lucidity of Act V's 'toi, ma Juliette' where he and Shumskaya shake the grooves (literally) so impassioned is their duet. His tone can also take on great powers of intimacy and consolation, encompassing all emotive states in this work with kaleidoscopic freedom. Shumskaya brings considerable reserves of power and theatrical tension to her role; hers is a strong rather dramatic soprano, not always entirely disciplined it's true, but quite capable of matching her partner as we've seen. She was forty-two at the time of the recording, five years younger than Kozlovsky and together they make a strikingly believable pairing, though not one, clearly, in the French mould of interpretation. The Mercutio is Ivan Burlak and he has an elegant light bass, commendably flexible. He is lyrical and phrases with line and momentum and his top is firm (especially in his Act I ballade). It's true that there are moments when an obtrusive bleat enters the voice but this is a less important matter than his engaging sensibility. Sokolova has a powerful soprano with a well-supported lower register and considerable projective power. She's occasionally unsteady but her full Olympian power can be heard in Act III's ' Depuis hier'. Basses Mikhailov and Petrov prove a strong, if stylistically anomalous pairing. Mikhailov was 54 and on top form, still fully in control of vibrato and light and shade whilst Petrov was half his colleague's age and had a more obviously intense and powerful sound. The conductor is Alexander Orlov and he directs with tremendous attack ï¿½ the fugal section in the Prologue sounding the alarm for his sweeping and galvanizing (but also poetic) leadership. The Ball scene has elegance and panache and he takes the Act II Entr'acte at a fine tempo. It's certainly not faulty balance by the conductor when the harp is so over recorded or that the strings sound so raw. Nor even that there is an echo round the voices, some of which come and go in distinctly spectral fashion. These were the hazards of the recording set up there. And to finish we have a small glimpse of another esteemed conductor, the coruscating Nikolai Golovanov who accompanies his much older wife, the legendary Antonina Nezhdanova and Kozlovsky in 'Ange adorable'. Despite the antique sounding recording (it was only 1938) it's a delightful pendant. Everything is in favour of this well-merited retrieval of a distinguished set. There are full and attractive notes that comment and reflect upon a noble and frequently fascinating recording." ï¿½Kozlovsky possessed a unique vocal timbre that has been described by various critics as ï¿½whiteï¿½, ï¿½nasalï¿½, or ï¿½androgynousï¿½. Additionally, Kozlovsky was not beyond stretching a phrase, interpolating his own dynamic effects, or holding a high note well beyond its written value. There is no question Kozlovsky lacked the kind of classic vocal warmth of such great Romï¿½os as Georges Thill, Jussi Bjoerling, and Alain Vanzo. On the other hand, Kozlovsky used his voice with such technical and vocal mastery that the end result is quite affecting and beautiful. And I find Kozlovskyï¿½s occasional liberties with the written score a welcome throwback to a time when singers were expected to imprint their personalities onto the music at hand.